48” in diameter, and it works with most commonly used pipe materials. Programming is easy with the on-screen menu system. Just enter the pipe diameter, wall thickness and pipe material. The F-4400 can be powered for up to 18 hours using the internal, rechargeable NiMH battery, or it can be operated continuously with the AC poser adapter. 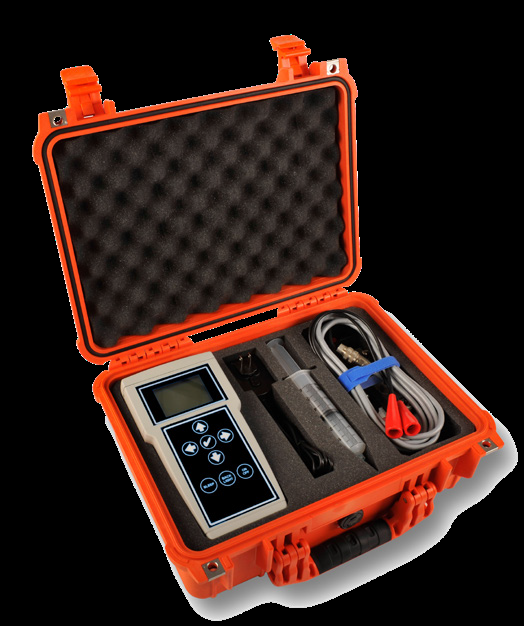 Monitoring flow over time is made easy with the built-in data logger. The logger can capture up to 300,000 points with intervals ranging from 10 seconds to 5 minutes apart. Download data to you PC via USB. A 4-20 mA output is also available when operating from the AC power adapter. 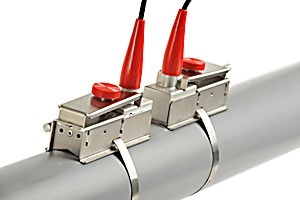 Clamp-on transducers allow for quick installation with no shutdown, no drilling and no pressure drop. 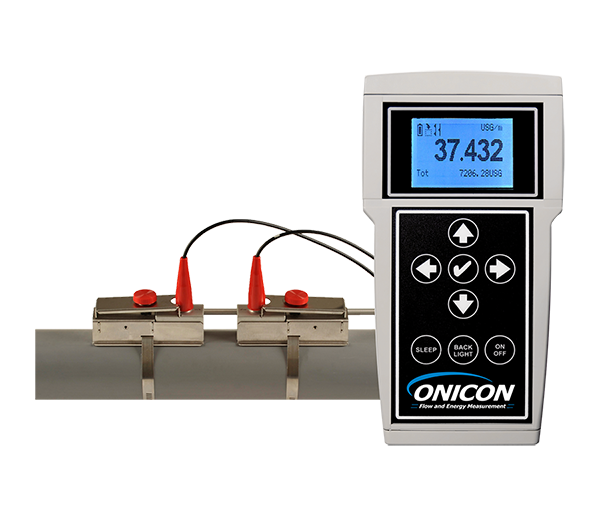 Each meter is provided with a built-in data logger making it an ideal solution for monitoring flow over time. The F-4400 is designed to work with many different pipe materials including carbon steel, stainless steel, copper, PVC, HDPE fiberglass. 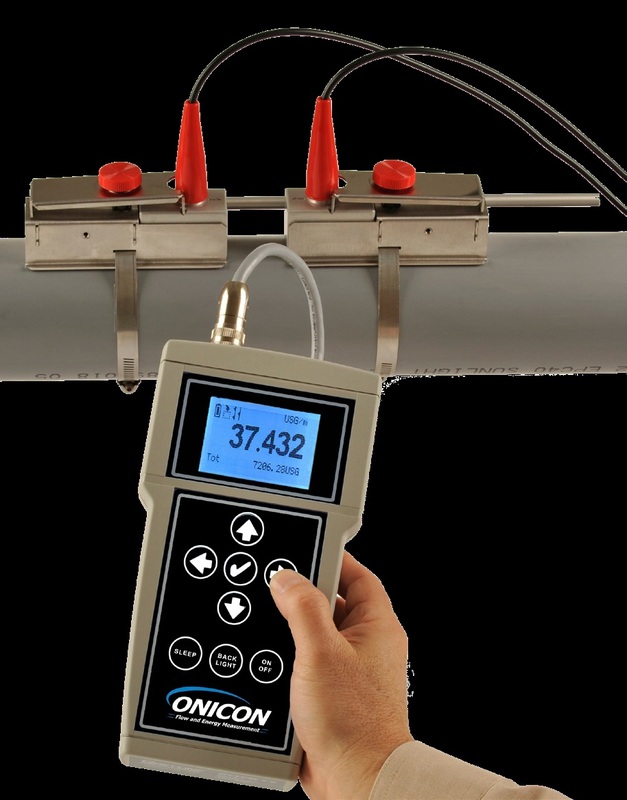 monitoring many different flow applications, including leak testing. 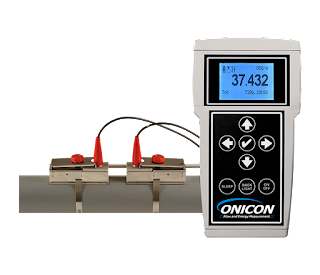 White, backlit matrix - displays a 5-digit flow rate with floating decimal point, a 14-digit totalizer, a calibration menu and a daily flow report.